Some tips for homebrewing on the cheap. Home brewing is a hobby you can start with a small investment in equipment ($150 or less) and make beer. At that point the biggest investment is the per batch cost. When brewing extract patches the fixed costs cost to brew are low, but the per batch cost is much higher. Brewing kits or recipes from my local shop can range from $25-$45. One of the main problems is that liquid malt extract (LME) is expensive, and dry malt extract (DME) is even more expensive. Unfortunately buying these items in bulk isn’t a much of an option. LME has a very limited shelf life. Any quantity dry is going to be difficult to work with, as it’s very hydrophilic. The leap to all grain could add a significant increase in your fixed cost, as well as complicate your brew day, but there are other ways to save money. One option is to buying your hops in bulk. You can significantly cut the per oz cost, at retail hops cost anywhere from $1.50 an oz, to $4.00 an oz. If you buy from an online shop that specializes in bulk hop sales, like http://www.hopsdirect.com/, http://www.yakimavalleyhops.com, http://labelpeelers.com/, willamettevalleyhops.com you can find prices ranging from $6-30 an lb. There are a few catches though. Shipping cost is going to add significantly to the price. The more popular varieties of hops may be harder to find in bulk, but if you shop in late fall when the new crop year’s product is release you will have the best options. You might even be able to get a much better deal on last years crop. Buying hops in bulk requires proper storage, in a freezer, not exposed to light or air. Stored properly your hops should last over a year w/out noticeable degradation. If you are lucky you might be able to borrow a friends vacuum sealer, and for the cost of a roll of bags, you can break down your pounds of hops in to sizes usable for single batch. 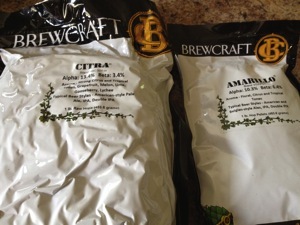 When I brew hops in bulk, I target a price of less than $15 per lb including shipping. I usually buy a few lbs at a time. Offsetting the premium hops like amarillo and citra with, work cheaper dual purpose hops like nugget, and columbus. I’m also always on the look out for specials, two for one sales, and inventory clean outs can yield great prices on hops. I’ve also found you can save a lot when reusing yeast. While a dry yeast packet is cheap, about 3.50 for a packet. You just don’t have the variety of liquid yeast. When you are talking about buying a pitchable quantity of liquid yeast, it costs at least $7 a culture, and higher gravity beers can require 2 or more packets/vials to have an adaquate sized pitch. Making a starter can help with that, but when you wash or reuse a pitch you are spend next to nothing on yeast after the initial batch. You can brew multiple batches in a row using the same strain. The steps are simple and detailed here: http://www.homebrewtalk.com/f163/yeast-washing-illustrated-41768/ . There are a few things to note. 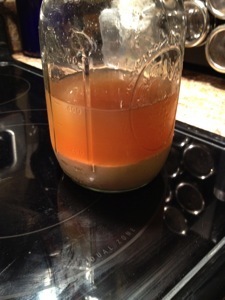 First you want to only reuse good clean yeast. If there is any question about the yeast, either your batch had a slow start, a poor fermentation, don’t risk it, toss it. I always keep a packet or two of dry yeast on hand for times when my yeast just isn’t right or ready. There is no need to lose a batch to bad yeast. Also brewing multiple batches in a row takes planning, you want to brew batches increasing in gravity and increasing in color. Brew your lowest gravity lightest beer first. With some styles of yeast you are limited in the beers you can brew. For example, the wyeast 3711 french saision strain from my last batch is pretty much saison only. I already have 5g of saison in a keg, and now 5g aging in a carboy, so I held off on saving the yeast, making a third batch. I nearly forgot to mention this, if you are lucky enough to live near a brewery, or a part of a homebrew club, you can often get a pitch for free. Just ask, folks are often willing to fill a growler or mason jar with fresh yeast slurry for nothing, but I’d bring along a homebrew or two to share. If you do decide to go all grain, despite the increased equipment costs, your per batch cost should also be significantly cut. I’m not trying to say that all grain is better, or even cheaper, there are just too many changes and investments in equipment and time to even start that discussion. What I am saying is the consumable costs associated with all grain vs extract is cheaper. All grain recipe kits are typically $5 cheaper than their extract equivalent. You can save even more buying your base malts in bulk. The per lb price for base malts is anywhere from 1.30 for domestic 6row to 2.50 or more for a continental floor malted pale. Buying these grains in bulk you can get them for as low as .60c an lb. That’s a huge savings. Why am I even talking about this? I had a discussion with my wife about how much this latest batch cost me to brew, and how much I’ve got invested in brewing. I was happy to point out this latest saison might be the cheapest batch I’ve ever brewed. My grains were bought in bulk, hops in bulk and on sale, and I reused my yeast. The entire batch cost me about $17.50 splitting the cost of the yeast over 2 batches. That’s not including fixed costs, but I’ll never recoup that. Not bad for a batch of 7% saison, featuring continental pilsner and rye. I guess what I am trying to show is that while homebrewing can be an expensive hobby, it doesn’t have to be. Look at this list, you could have an all grain setup, ready to brew 4.5g batches for around $150. It makes some compromises, but nothing that should impact beer quality. $50 turkey fryer and pot. $10 Build a braid for cooler. $19 Misc stuff (hoses, blow off tubes, air locks). If you are on a shoe string just trying to brew good beer, it can be done without cutting corners on the important stuff, quality grain, hops, or even liquid yeast strains. My costs per batch are also all over the place… the Schwarzbier I brewed a couple of weeks ago is probably my cheapest yet. All the grains used, except for a bit of specialty grain, were bought in bulk, as were the hops (which were only a couple of small Hallertau additions). I reused the yeast from my previous Vienna Lager… total cost for a 5 gallon batch came to about 8 bucks (plus the cost of propane, I guess).